Locksmithing is a very niche service that requires professional technicians who are highly trained, certified and experienced in addressing residential, automotive and commercial lock and security needs. Trust Lock Dawg Locksmith in Jefferson, GA to respond with the highest quality services you need for both emergency and routine situations. Lost Your Antique Skeleton Key? We Can Make A New One On The Spot. Your residential locksmith needs may range from producing a new key to get you back in your home because of misplaced or damaged keys to rekeying or replacing all of the door handles throughout your property to provide one-key solutions or update your security with new hardware. Digital lock technology is the latest and greatest in secure home access, allowing access through the use of a numbered combination or even biometrics, with keyed backup in the event of an interruption of power or system issue. Whether you choose traditional locks or choose to upgrade, our locksmiths are experts at installation, maintenance, and repairs whenever they become necessary. And in an emergency lockout scenario, you’ll never have to worry about “finding a locksmith near me” – a mobile Lock Dawg locksmith nearby can be onsite fast to avert any further issues. 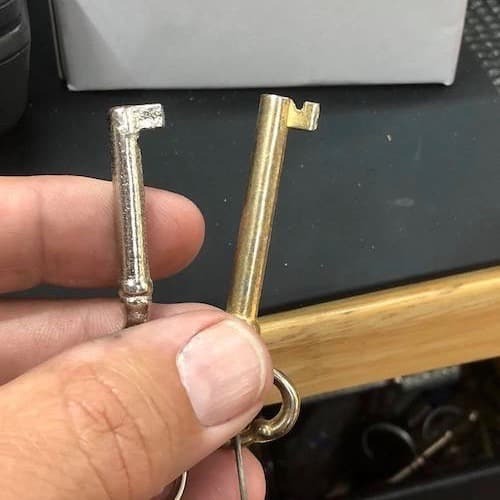 In the commercial world, Lock Dawg services business from mom-and-pop shops with a broken door lock to larger buildings in need of mass rekeying or the installation of enhanced security locks to provide employees and manufactured goods alike. Rekeying services are one of the backbones of our commercial locksmith services. Those projects become necessary when a company moves into a new location, layoffs or turnovers occur, or when a business is ready to upgrade its current locks with next-generation technology. We can make keys on location for lockouts or rekey many doors quickly in order to uphold the highest security standards. We also offer solutions for irregular doors on loading docks, garage doors in storage areas, as well as safes and lock boxes that employ both old school locks and combinations or the newest digital technology. We Make Car Keys in Jefferson GA.
Gone are the days of the friendly corner police officer using a hanger or his slim jim to get you back in the vehicle you’re currently locked out of. While a slim jim may still work to unlock some vehicles, it’s important to trust a trained locksmith to employ it. Otherwise, you may experience the accidental damage to other door mechanisms that can occur when that tool is used by someone inexperienced. For other lockout issues, our locksmiths carry lockpicking guns, car key maker software and devices, and other specialized tools to ensure that you get back in your vehicle at the soonest possible time. 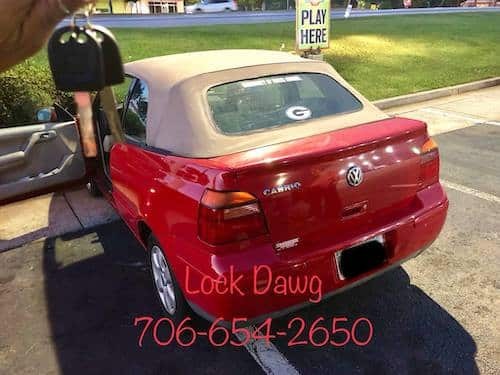 Additionally, if your car issue centers around something that has become stuck in your ignition, whether a foreign body or broken key, Lock Dawg auto locksmiths are prepared to perform the work necessary to get you back on the road. When you need locksmithing work done in your home, office or car, choose a reliable, highly rated and affordable service to get the job done right. Lock Dawg locksmith in Jefferson, GA offers a full complement of locksmithing work through a mobile locksmith service that can arrive at your location quickly and get the job done fast. In addition, we are insured, employ the most highly trained technicians, and offer the most affordable services to accomplish all of your locksmith needs.